NORMAN IS A TYPICAL EIGHT-YEAR-OLD BOY. EXCEPT FOR BEING A PSYCHOPATIC KILLER THAT IS.Norman has killed people. Too many to count. He's bumped off classmates, relatives and even the odd monster! But how did this angelic-looking little boy become so terrifying? 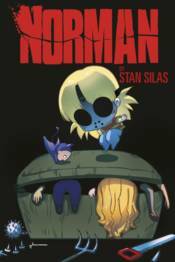 Norman: The First Slash goes even deeper into this mini murderer's horrifying past! A hilarious dark comedy illustrated in Chibi Manga style!